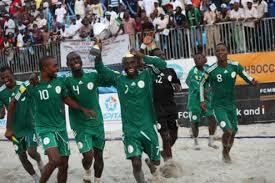 Sand Eagles off to Bahamas for FIFA Beach Soccer World Cup – Royal Times of Nigeria. 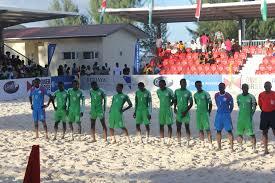 Nigeria’s Beach Soccer national team, the Sand Eagles will depart for the Bahamas on Thursday for the 9th edition of the FIFA Beach Soccer World Cup that kicks off next week. The team is being led by the experienced Abu Azeez who came out of retirement at the last edition of the CAF Beach Cup of Nations held in Lagos. Also on the trip are veterans Isiaka Olawale, Bartholomew Ibenegbu and Ogbonnaya Okemmiri while Victor Tale, Emeka Ogbonna and Emmanuel Owoferia also made the cut. Nigeria, coached by Adamu Audu Ejoor, are in Group B of the competition and will come up against Italy, Mexico and Asian champions Iran. Their first group game will be against the Europeans next Thursday. Eight of the players on the final roster will make the trip to the Bahamas while four will join up five days later. The Sand Eagles last featured at the Beach Soccer World Cup six years ago when the tournament was held in Ravenna, Italy.